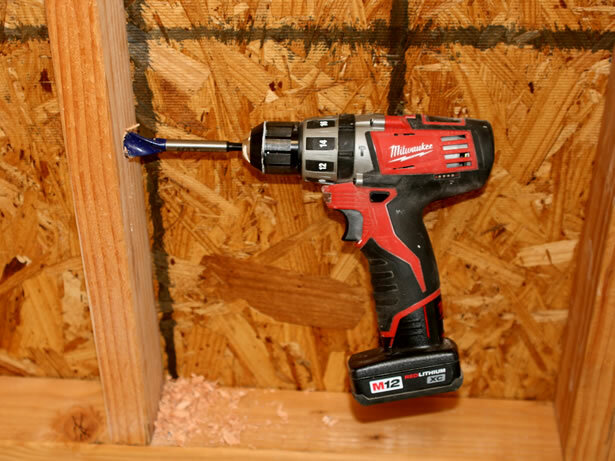 The M12™ Cordless 3/8″ Hammer Drill Driver is the industry’s first sub-compact hammer drill driver. At only 7-5/8″ long and 2.8 lbs, it is the lightest and most compact hammer drill driver on the market, making it ideal for contractors, maintenance technicians, and remodelers desiring maximum portability with the performance to get the job done. The 2411-22 delivers best in class power, speed, and durability, with 275 in lbs of torque and 0-400 / 0-1,500 RPM. The 2 speed metal gear box and 3/8″ metal single sleeve ratcheting chuck provide maximum durability and superior grip and bit retention. An on-board fuel gauge and built in LED light provide even greater convenience to the user during prolonged use. Includes: 12V Cordless M12 3/8-in Hammer Drill Driver Kit – 2411-82, (2) 12V M12 Lithium-Ion Batteries, 30-Minute Charger, Carrying Case. Warranty: This product is backed by a one-year warranty that protects against defects in materials or workmanship. M12 LITHIUM-ION batteries are backed by a two-year battery warranty. I have been a home owner and residential/commercial contractor for many years. This has allowed me to experience everything from simple home repairs to complete kitchen and bath remodels and room additions. Over the years, I have personally experienced the good and bad with loads of different corded and cordless power tools from most of top manufacturers around. I must say, it has been truly amazing to witness the technological advances put into these tools throughout the years from the materials they are built with to the power plants and ergonomic designs. Some of the biggest advances that I have noticed have been in cordless batteries. I would be surprised if battery longevity and capacities from most manufacturers haven’t improved by more than a thousand percent just in the last 10 years. 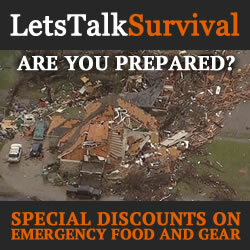 Most importantly, having the right tool for the job can make all the difference in the world. From the how long it takes to complete each step of the project to the over-all quality and final result. As a result, making the right choice in which tool to purchase can be a daunting task. After all, there are so many different manufacturers to choose from. Not to mention, most manufacturers produce numerous models varying from light-duty “home” versions to heavier commercial-duty “contractor” models each sporting a wide-range of features. I recently found myself in need of a new cordless hammer drill to replace my 18 volt DeWalt. It was about 10 years old and very tired. Not to mention, very heavy! 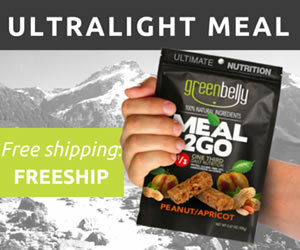 I thought this time around, I would look for something quite a bit smaller and lighter weight. I also figured that I could make do with a 3/8″ chuck as well. I feel that higher quality tools often justify the higher price. I am happy to spend a little more for a tool built well enough to last me five to ten years (and sometimes much longer). I can’t think of too many things that bother me more than having to replace a tool (power or otherwise) every other job. So for the sake of my sanity, I will usually shell out a little more when it makes sense. After some research online and a quick trip to the local hardware center, I found myself standing in front of a wall of cordless drill/drivers. After playing around with each one to get a feel for the weight, balance and ergonomics, I quickly narrowed my field down to a few different makes and models. While many were just too heavy, others felt way too cheap, unbalanced or downright awkward. After finding myself in front of a rather large Milwaukee M12 tool display demonstrating many of the compatible M12 power tools, ready to play with. I decided to take a closer look. M12 is Milwaukee’s latest 12 volt Lithium Ion product line sporting a huge assortment of tools available. Traditionally, Milwaukee has always been known for their quality and you can really feel it when you handle one of them. And the best part, they all share the same batteries and chargers. The length and diameter of the handle of the Milwaukee 2411-22 M12 12-Volt 3/8-Inch Hammer Drill are slightly larger than the comparable DeWalt which felt very comfortable in my hand. 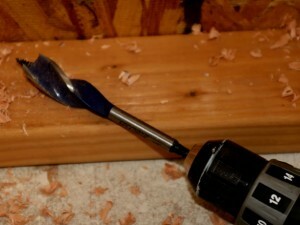 The handle and much of the frame have a firm, non-slip rubber coating which only adds to the comfort of the tool. The handle and frame are quite compact allowing you to get into much tighter spaces than that of the larger 18 and 24 volt drill/drivers. The frame of the Milwaukee 2411-22 Hammer Drill feels very sturdy and doesn’t flex much at all, even when under a heavy load. The drill can bore holes somewhat effortlessly into 2x4s for plumbing and electrical conduit using a large Irwin Speedbor Max self-feeding auger bit. Additionally, the weight-to-power and balance of the Milwaukee 2411-22 Hammer Drill are superb. Even after a long day of drilling holes and driving screws, I didn’t feel any of the arm and wrist fatigue that I had experienced while using the heavier 18 volt DeWalt’s in the past. Directly behind the 3/8″ chuck and clutch, there is a heavy-duty rotating selector to set the drill mode. You can easily adjust from hammer drill to drill only or driver mode with a quick twist of the selector. The adjustable clutch sits directly in front of the mode selector providing clutch settings by twisting the clutch ring around the drill body. The numbers are large black letters on a aluminum disc so they are easy to see. The lightest clutch setting is 1, with 18 being the highest. The keyless 3/8″ chuck spins easily to open and close and grips onto bits tightly. There has been no noticeable slippage with any bits that I have tried so far. On the top of the drill’s body, there is a sliding power selector to adjust between the high and low gears with just a quick flip. The gear selector protrudes slightly from the top of the body making it easier to adjust. While it looks like it might switch by itself when drilling up against a wall or stud, it has not moved on me yet. The forward and reverse switch can be easily adjusted simply by sliding the switch from one side to the other through the handle. The switch can easily be adjusted whether you are right or left -handed. The moulded single-finger trigger performs three functions. Lightly pressing the trigger activates both the LED work lamp and the LED battery gauge. The LED lamp located just above the trigger shines a bright white light on the workspace directly below the the 3/8″ chuck. The battery gauge provides 4 LED lights which show the amount of battery available. Pressing the trigger further activates the variable-speed motor. The harder you press, the more RPMs the drill will turn. When I purchased my Milwaukee 2411-22 Hammer Drill, I also purchased two of the Milwaukee 48-11-2402 M12 XC Lithium-Ion Cordless Tool Battery. 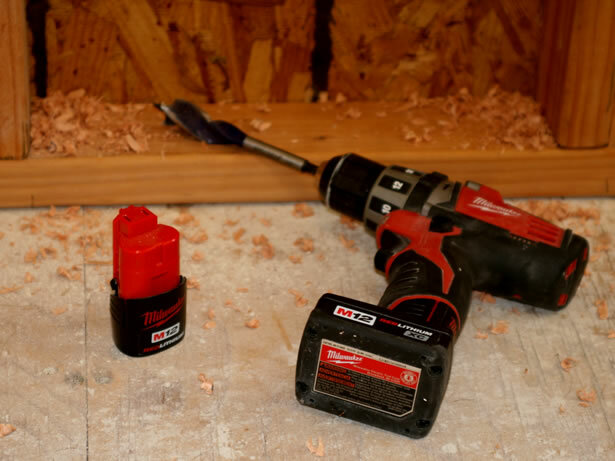 The wider base of these XC batteries allow the Milwaukee 2411-22 Hammer Drill to stand upright without falling over as an added benefit to the extra power and battery life that they provide. From the time I received my Milwaukee 2411-22 Hammer Drill, I have thrown many jobs at this drill. From boring holes in 2x4s to drilling holes in steel brackets and driving lag bolts, it has never fallen short of completing the task at hand. Additionally, the drill has survived a number of tumbles off of a workbench and even a 6ft ladder without a scratch. The Milwaukee 2411-22 Hammer Drill has been a true joy to use and has exceeded all of my expectations. From the quality materials it is made from to the power, weight and balance, I am certain this tool is going to last me a long time. If I ever find myself needing another, I would certainly look to Milwaukee first. If you get the chance, try one out for yourself. In 1924 Milwaukee Electric Tool introduced the Hole-Shooter, the first lightweight, portable, one-handed 1/4-inch capacity drill, and the company has been dedicated to producing innovative, heavy-duty electric power tools that meet the needs of professional users ever since. Milwaukee’s product line has grown to include more than 500 tools and over 3,500 accessories. Milwaukee uses state-of-the-art technologies and sophisticated manufacturing techniques to ensure that quality is built into each of its tools, resulting in durable and reliable professional products.